See hundreds of elephants in Amboseli National Park whilst enjoying spectacular views of Africa’s highest peak, the iconic Mount Kilimanjaro. Day 3: Masai Mara game-viewing! 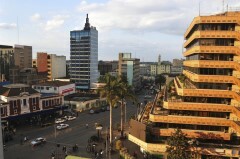 On arrival at Nairobi airport you will be met and transferred to your hotel. Depending on your arrival flight time we highly recommend a visit to the David Sheldrick Wildlife Trust, an elephant nursery which provides a safe haven to orphaned baby elephants. After breakfast we proceed across the beautiful Great Rift Valley to the world-famous Masai Mara Game Reserve. Situated in the south-eastern corner of Kenya, the reserve is home to the greatest concentration of large mammals on earth. The Masai Mara and the Mara River form part of the world-famous Great Annual Wildebeest Migration, and timing your Masai Mara Safari to coincide with this can be critical. We arrive in time for lunch and in the afternoon, enjoy an enthralling game-viewing drive. Spotting lions, cheetahs and other spectacular predators is the highlight of your day and we might even spot a traditional Maasai Warrior who are still quite common in these parts. This evening, enjoy a sumptuous dinner at your lodge. After breakfast, proceed on a full-day game-viewing drive to search for the myriad species of game that make this reserve their home. If you are lucky, you can witness a kill in action, moment by moment, right in front of your unbelieving eyes! Return back to your lodge in time for lunch and a rest before enjoying another exciting game drive in the late afternoon when animals are easiest to spot. Enjoy a delicious dinner at your lodge and reflect on what is sure to be a highlight of your trip. After breakfast, drive to Lake Nakuru keeping an eye out for game along the way. 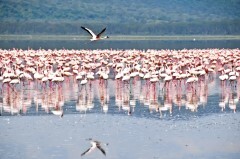 Lake Nakuru is one of the Rift Valley’s soda lakes and is rich in birdlife with over 400 resident species including abundant pink flamingos which number their thousands, sometimes millions and feed on the algae in the lake. You'll drive through the park and arrive at your lodge in time for lunch. In the afternoon we embark on a game drive and along with the birdlife we will hopefully spot the rare Rothschild’s giraffe, black and white rhinos and predators such as lions, cheetah and leopard. Dinner at your lodge. After breakfast we drive to Amboseli National Park located at the foot of Mt. 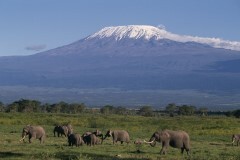 Kilimanjaro, Africa's highest mountain. 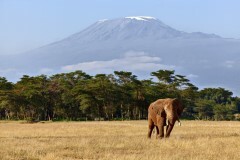 The snow of the mountain forms a majestic backdrop to one of Kenya's most spectacular displays of wildlife including lion, elephant, leopard, rhino, cheetah, buffalo and host of plains game. Lunch is served at the lodge with some time to relax. In the late afternoon we will enjoy a game drive before spending dinner and the evening at our lodge. Today we rise early and take in the impressive views of Mount Kilimanjaro before clouds build up over the summit. We set off for a dawn game drive to view a multitude of wildlife which call Amboseli home including everything from Wildebeest to Giraffes to Baboons. After time for lunch and a rest we then enjoy another evening game drive, returning to the lodge for dinner and overnight. This morning we finish this magnificent adventure as we depart for Nairobi in time for your departure flight. Transport in a 4WD safari landcrusier with English speaking driver guide. All transfers on arrival, while on safari and on departure. AMREF flying doctors cover for rescue and evacuation.